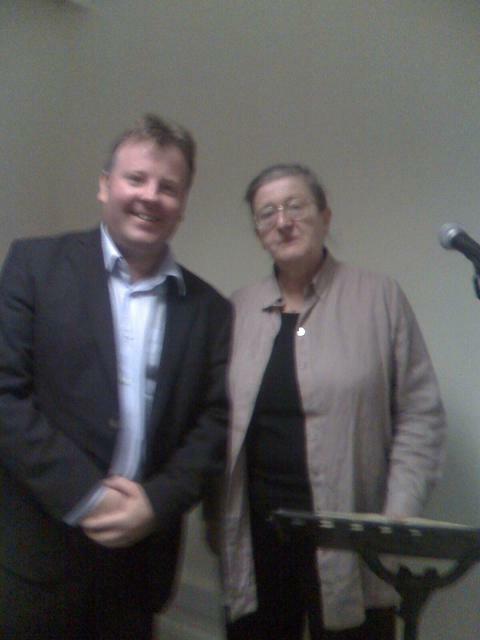 As I mentioned yesterday, Margaret Barker discussed her fascinating theses concerning Temple theology today, and I took the opportunity to get the following picture taken of us both. I also purchased a discounted copy of her brand new book, Christmas: The Original Story, which I am really looking forward to reading (when I get the chance!). Her presentation was not only highly stimulating, but she was very personable and friendly. I’d be interested to learn what people think about her arguments, where there is room for improvement or even complete overhaul, what has shed fresh light on the evidence or utterly convinced you. While I am actually not too convinced that there was a specific 'temple theology' that was so completely essential for early Christians as she maintains - and I am even less convinced by the 'YHWH as Son of the Most High' proposal -, I will re-read some of her arguments in the near future with a renewed hermeneutical openness. she is a very friendly person. Vautsi! She looks like a guy! Who's the lady in the left? that is her happy face. you dudes are just mean. Y'all appear a little blurry, but I'm sure you're not so in real life. I know very little about Temple theology, which is actually true about most theology. (Tobias Haller says I should not preface my remarks with, "I am not a theologian," so the above is my compromise.) I recently read Raymond Brown's The Community of the Beloved Disciple and found it to be absolutely fascinating. I learned so much about the early Johnian (Is that the proper word?) Christians. Now that's probably old hat to those of you who frequent this blog, but it was all new to me. Just to let you know that even though I'm running far behind, I'm try to catch up. You certainly look better when the camera is blurry, Chris--but then that's true of most rock stars and televangelists. I think it would be really interesting if you wrote a book review of 'Temple Theology', around 3000 words would do nicely.